From the Spintastics website: "Aluminum, winged-style ball-bearing yo-yo with bearing hubs. This is a responsive yo-yo. Can be made into a 'Bind' yo-yo by cleaning the bearings. Spintastics' FIRST aluminum yo-yo named for its 3 bearings. Double wide gap, wing shape, concave bearing sleeve, silicon fill response, with BEARING hubs and grind ring. Beautiful gold grind rings on all colors (blue, purple, gold, black). Base yo-yo is 58 grams; with grind rings installed, 69 grams; with hub spinners installed, 67 grams; with everything installed, 78 grams." 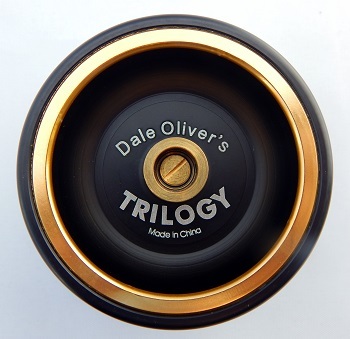 The Trilogy is the first full-metal yo-yo produced by Spintastics, released in 2009. Despite poor reviews by players, the yo-yo remained for sale on Spintastics website as late as 2015 when the model in this exhibit was purchased. As of around 2016, Spintastics Skill Toys, Inc. is now know as Science of Spin, Inc.
"Spintastics Skill Toys, Inc. has been owned and operated by Dale and Val Oliver since 1997. Dale, the 1992 World Yo-Yo Champion, began designing his line of yo-yos in 1995, predominantly for his renowned “Science of Spin” school program, with quality and affordability in mind. His world class performance style, teaching ability and remarkable foresight in research and development, along with Val’s yo-yo and spin top skills promoting the ‘Science of Spin’, and Business Degree, resulted soon in the retail market taking notice. This placed Spintastics in the top 5 U.S. yo-yo manufacturers, making it the only manufacturer of a yo-yo owned and designed by a world champion himself. His designs quickly blossomed not only into a full line of quality yo-yos, but that of spin tops and diabolos as well. In addition to a Fort Worth, Texas manufacturing facility for spin tops and yo-yos, Spintastics also manufacturers yo-yos in Taiwan and diabolos in mainland China. Dale is now semi-retired, but remains active in his never-ending design of skill toys. Val continues to present the ‘Science of Spin’ to students in schools and libraries across Texas. In September 2015, Lars and Andrea Hundley, owners of Yoyoplay in Dallas, Texas, one of Spintastics’ long time and valued customers, purchased the manufacturing of the Spintastics’ line of Diabolos and Spinabolos. By April 2016, they also acquired the manufacturing of the Spintastics’ line of Yo-Yos, as well as the trademarked name ‘Spintastics’ itself, holding and maintaining the quality reputation in the skill toy industry. Due to these organizational changes, Spintastics Skill Toys, Inc., is now named Science of Spin, Inc. It remains the sole manufacturer of the Spintastics’ Line of quality Spin Tops and Dale and Val Oliver remain the owners.Science of Spin, Inc. maintains the Science of Spin program and continues to supply all lines of Spintastics’ skill toy products to schools and professional skill toy demonstrators across the country in the same manner that has always been done. The Spintastics domain continues, now owned by Yoyoplay, and links directly to Yoyoplay’s Spintastics’ product page, where all three lines of products will be available. Yoyoplay has agreed to handle the web site sales of Spintastics’ Spin Tops as well, allowing Dale and Val the much deserved freedom from the daily activity. Web site customers can be assured that this IS the official Spintastics’ Spin Top page even though it is flowing through the Yoyoplay website. Science of Spin, Inc. will remain the manufacturer, contact and seller of spin tops to wholesale accounts. We are excited about this unique and successful collaboration between our companies, Science of Spin,Inc. and Yoyoplay, assuring the quality line of skill toy products you rely on for years to come. Science of Spin, Inc. (Formerly Spintastics Skill Toys, Inc.), Fort Worth, Texas Yoyoplay, Dallas, Texas."